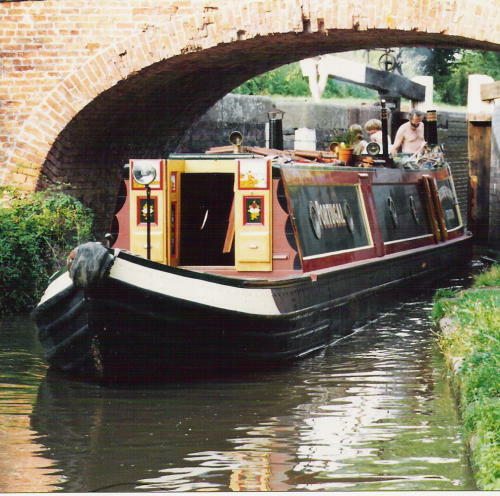 Warwickshire Fly Boat Co. has a long history of specialising in the repair and refurbishment of working narrow boats. Latterly a number of new boats have been constructed incorporating the shape,character and good swimming and handling characteristics of the originals. Needless to say that the majority of the boats on our moorings reflect this. Our dry dock is operated by Stockton Dry Dock Co. (01926814441, email Graeme stocktondrydock@gmail.com) who continue to undertake refurbishment,repairs and replicas.Currently the motorised Baildon is being restored to its original butty status.Typhoon is also on dock for cabin work and refurbishment of guards.Two BCN day boats have been completely refurbished using modern and original hot rivetting tecniques and may be seen in use at the Black Country Museum. Warwickshire Fly Boat Co. operate moorings on the main line of the Grand Union canal, and on the Kayes Arm. We sell a number of boats on brokerage currently including original working boats,restorable hulls and newer replicas,with rebuilt vintage engines of course! See under narrowboats for sale. Narrow boat painting undertaken by Michael Looby in our insulated paint dock: 07702128005. Fitting out and any timberwork carried out by Reg Thompson in workshops and covered wet dock on site. Recent back cabin fit out of nb Admiral and Crane available for inspection.Currently working on Typhoon and an undercloth conversion of Ipswich. Ring 07968765347 or see http://www.narrowboatwoodworking.co.uk for details. BWB licenses available here-short and long term mooring available with water and electricity.